"The bright yellow jelly that appeared under the tree in our front garden was a slime mould’s plasmodium, I now know, thanks to Life in the Soil. Biologist Nardi not only catalogues organisms—from algae to wombats—that live in soil, but also explains their roles in the web of life. Aimed at gardeners as well as naturalists, with a final section on DIY composting, this book uncovers the densely populated world that exists, literally, right under our feet, bringing to light countless flies and beetles, and such underground stars as termites and earthworms." "If the earth moves you, then this is where you’ll get all the best dirt on what lives, what dies and how everything in the soil is connected by an ever-expanding web of life. This is a book that can be read by naturalists and gardeners like a novel as the drama of the soil is churned forth, plowed through and dug into. You’ll learn about wolf spiders with glowing red eyes, snails with 120 rows of teeth, and lime molds, mites and roundworms in such a manner that they become allies in the fight to keep our earth and our soil healthy. This is a unique book written by a biologist who makes the case that life itself depends on how well we treat all those millions of creatures right under our soles." "Although most are microscopic, the trillions of species that inhabit the ground we walk on is astonishing. No book could describe them all; this one identifies larger groups: in the case of microbes we get only kingdoms, but for more complex animals, phyla, classes and even families. A very useful survey." "A missing entry in the book rack has long been a real in-depth book on the livestock in the soil. Jim Nardi has now filled that void. . . . The cast of characters in this underground drama runs into the millions. Nardi has the figures, and his book is punctuated with tables, diagrams, charts and artwork—his own art—which together make this book a most reasonable encyclopedia. Life in the Soil is published by the University of Chicago Press, price $25—actual worth, several times that much. Farmers and gardeners will walk into the light when they read this one, especially those who compost and measure life itself in terms of bio-correct growing." "A must-read for anyone who wants a better understanding of this world and how to protect it." "[I strongly recommend you] to go out and get this book, not from the library but from a store. It is well worth owning. Not only did I find it a great read, but it is a reference book I will turn to often. Nardi subtitles his book A Guide for Naturalists and Gardeners. This is apt as Life in the Soil does a fantastic job of describing (often in exquisite and fascinating detail) the major players on the soil food web stage. I couldn’t put it down. OK, I admit that I am a soil nerd, and naturally this kind of work would appeal to me, but honestly, each page contains so much information presented so well that all gardeners will benefit greatly from owning it. For starters, the book is extremely well-organized. All members of the animal kingdom are represented, and each group is accompanied by a fact box that contains the scientific classification, size, common names, their place in the soil food web and their impact on gardening. If the book contained only these boxes, it would be worth it. However, Nardi is a skilled scientific illustrator as well as a biologist. Almost every page has a detailed picture of the organisms (with size reference) he is describing, often showing not only the animal but its habitat, including those it eats or those that eat it. You will surely recognize animals you have seen before but were not able to identify. . . . From the ground squirrels you see in Denali to wireworms, caterpillars and moths, flies, wasps, ants, japygids and earwigs, Life in the Soil will help you understand and identify the life in your soil. Birders have their Petersons and Sibleys. There are guides to snakes, butterflies, mammals and all sorts of other natural things. Now we gardeners have a guide to the critters that make up the soil food web." "This very inviting book about the mysterious world beneath one’s feet—too often shunned as simply ’dirt’—is beautifully illustrated with drawings and diagrams by Nardi. . . .The book is jam-packed with kernels of knowledge, especiall in handy ’fact boxes’. . . .This scientifically up-to-date book is also enjoyable to read it will be useful as a field guide and reference. Highly recommended." "[A] superb new book ... A splendid introduction to the world of soil. Not only does it provide an ample introduction to soils as a ’marriage of the mineral world and the organic world’ — that is, to basic soil science — it also furnishes the reader with an extensive account of the soil community, detailing organisms from kangaroo rats to microbes. . . . Crisp prose, color photos, and delightful illustrations (the author’s work) make Life in the Soil pleasingly complete without getting stuck in the mud. At approximately 300 pages, Soil can afford to dazzle as well as inform. The reader may emerge not only a more astute naturalist and steward of the soil, but also will come away with a few pleasing tidbits to share." "This delightful and insightful book tops all others we’ve read . . . on soil biology at a beginning to intermediate level. Here is science writing at its best: lucid and engaging." "This is an invaluable popular review of the soil biota that has few other books to compete with. . . . The overall quality of production of the book is excellent and it is very good value for its price. . . . I can recommend it higly to all naturalists and it will also find a place on the bookshelve of most soil ecologists as an excellent reference." "Let me just come clean . 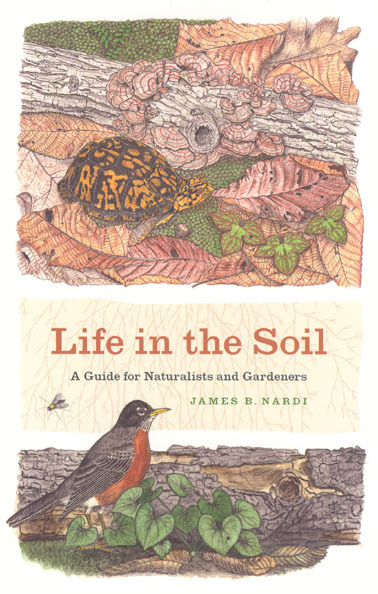 . . right off the bat: I love this book. . . . Life in the Soil is what descriptive natural history books should all be, but too few actually are. It is appropriately detailed and comprehensive, but it is also easy and fun to read. The enthusiasm of the author and his own sense of wonder come through loud and clear in both his words and his artwork." "This book fills an important niche missing in the soil science lexicon, that being an academic treatment of soils for a more wide ranging audience than most soil texts. . . . This book could be the missing link for introductory soils courses for nonmajors, fish and wildlife programs, soil biology courses, . . . forestry, natural resources, landscape ecology, horticulture, serious gardeners, and a general audience looking for more than the usual light treatment of soils. . . . I love this book and hope to incorporate it into my soils for non-majors class."